We landed an awesome house sitting gig in Costa Rica but we needed to be down there a week before school was out. Mick and I quickly came up with a plan. Tag and I would drive down ahead of Mick and Ela. This would allow Mick to finish her teaching contract and give Ela more time to say goodbye to her friends in Guatemala. It also meant Tag would miss his Kindergarten graduation ceremony. This worked out great! He did not want to go (let alone wear a cap and gown), and this was not a top priority event for us. I know some people love these things but they are not our cup of tea. Having the opportunity to skip my son's kindergarten graduation, with him, was right up my alley! We had roughly a week to pack everything and prepare for the overland trip. Fortunately I had already done a lot of research on these border crossings. Central America consists of seven countries. We'd be driving in five of them. Central American Geography 101. The yellow countries indicate those we'd be driving in / through. Based on my research I knew we could make the trip in four days (assuming everything went smoothly at the border crossings and we had no issues with the car). I gave us six days to make the journey so we'd have buffer. Park your car and go to the immigration building/window, They'll carefully look at your passport to make sure it is legit and that you have not overstayed your visit. This is not a quick process. They generally enter information into a computer system and that takes time. You frequently leave this window with an exit stamp on your passport. Go to another window (which is commonly in a different building) to get your car permit cancelled. Again this takes a while. They want to ensure your car has not overstayed it's visit. If it has, you are likely going to pay some big fines. You generally leave this window with a copy of your cancelled car permit. Your car is fumigated (externally sprayed with some kind of supposed poison to kill who knows what). Sometimes pay for this, and sometimes it's free. Your passport is checked to make sure you lawfully exited the prior country. It is then inputted into their computer system. You leave with a stamp showing you legally entered the new country. You fill out paperwork for your car to apply for a Temporary Import Permit (TIP) or car permit. Your car is inspected by customs and/or a policeman to verify the VIN number on the car matches your paperwork. You leave this station with a piece of paper that is your car permit for the country. You do not want to lose this piece of paper. Somewhere along the way you probably will pay an entry fee for each person in your group, your car or both. You'll likely have to make photocopies of some official document or receipt (there are multiple people/stores with cheap copiers at every crossing). You might also be required to buy car insurance when getting your car permit. Prices, the actual process and entry requirements for all of this vary by country. There are no signs directing you to what needs to be done or how much something costs at any of the borders. It can be an intimidating feat, but, thanks to a lot of other expats, there's plenty of info online that details the process. I found the information at My Overland Adventure to be the most helpful for our trip. They detailed the entire process (including GPS coordinates and pictures) for almost every one of our crossings. The info at Border Helper was also useful. I highly recommend reviewing border requirements in advance, otherwise you will be thronged with locals insisting that you need their help with the process because it is "confusing and slow". They will tell you that for a small fee they can help you. Don't do this! You do not need their help. It will cost you more money and likely will take more time. Trust me. We went this route when crossing between Mexico and Guatemala. Live and learn. Before leaving Guatemala I had my oil changed and asked my mechanic to give my car the once over. All good. Mick and I had wondered if we would have problems crossing borders as single parents. We'd each be travelling with one kid and no spouse. The online research was inconclusive. Friends of ours who had done similar trips had not experienced any problems when travelling by car...just by air. A number of airlines have policies requiring both parents to travel with the kids or some type of documentation that says the other parent approves of the child travelling internationally with one parent. This is likely due to domestic disputes between rivaling parents flying out of the country with kids. We did not want to hedge our bets against a foreign country's laws that are unclear or worse, open to interpretation. We went to a lawyer in Guatemala and had her draft a document that states we give each other permission to travel internationally with one or both kids, without the other present. We signed the papers. She stamped and notarized them. This cost us $30 US. We were set. Early one Tuesday morning we woke Tag from his slumber and put him in the car. He and I said quick goodbyes to Mick and Ela, as well as our landlord Estella and her son Abdul. It was 6:15 AM and we were off. 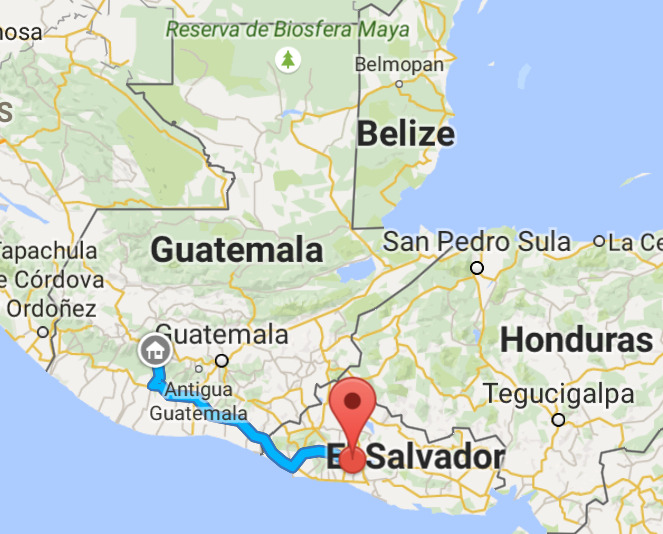 Our plan for the day was to drive across southern Guatemala, cross the border into El Salvador and trek half-way across the country to the capital city of San Salvador. Out last view of this amazing lake. Goodbye Lake Atitlan! You were an awesome place to call home. The our route for our first day of travel. Leaving Guatemala and entering El Salvador took about 2.5 hours. Exiting Guatemala took the bulk of this time. Foreign cars in Guatemala are only given a 90-day car permit that is seldom renewed/extended. I had renewed mine every 90 days and as a result my car had not left the country for 10 months. This was a curveball for the Guatemalan customs agents. It took some extra time but eventually they cancelled the permit as per their normal process. One of the first faces we were greeted by in El Salvador. We made it into San Salvador that afternoon without incident. Tag and I got settled into our hotel and went across the street to an awesome shopping mall. We grabbed dinner and went to bed early. The next day was going to be a long travel day. Honduras is a country I want to explore. It is known for having great beaches and some incredible ruins. But...this was not the trip to explore Honduras. Instead, we'd drive a popular route along the Pan-American highway that cuts across 82 miles of Honduras. It's a remote and pot hole filled road, but technically it's a highway. Our plan was to leave our hotel in San Salvador at 6 AM, travel across the second half of El Salvador, cross into Honduras, drive across that small strip and into Nicaragua all in one day. I knew from reading some of the online forums that this was doable, assuming there were no road closures, issues at the borders, etc. So we gave it a shot and...we had no problems. Our route for day 2. Cutting across the southern tip of Honduras and into Nicaragua. The biggest hassle was the initial crossing into Honduras. The country wants multiple copies of everything. Copies of your cancelled El Salvador car permit, passports, car title, car registration, etc. It was quite the zoo but I knew it would be in advance. It took about 1.5 hours. 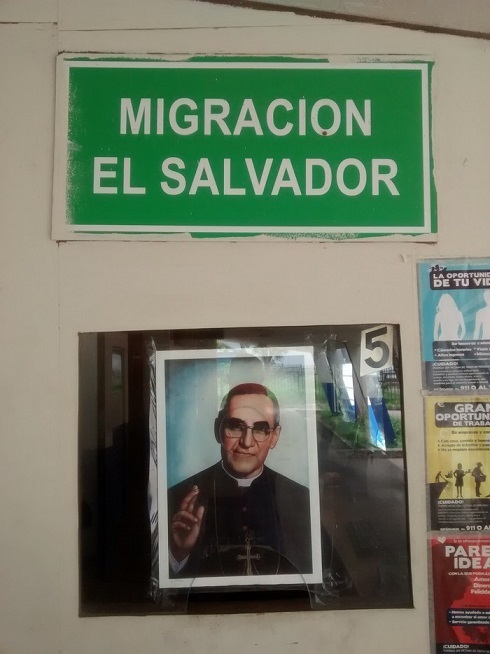 This was taken in the customs building in Nicaragua. There's no AC and very few fans. While I was processing paperwork, Tag decided to do the only thing one can do to manage the heat. He curled up in the shade in front of a broken window that had a slight breeze and stayed very still. He was a trooper! As we entered into Nicaragua we were welcomed by these guys. The cattle were all over the highway. We ran into several herds in the first hour of driving. Needless to say the driving was slow. The countryside in Nicaragua is pretty. This is the San Cristobal volcano. At just over 5,700 feet it is the highest volcano in the country. Yes, it is active! That night we stayed in Chinandega, Nicaragua. We slept great. From this point forward we were no longer in a hurry. We actually had time to explore Nicaragua. Costa Rica was one border crossing away. We went out for hot dogs to celebrate our arrival in Nica. Tag decided to have a fight with the store's logo. We always blend in with the locals where ever we go...not! Granada has been on our short list of cities to visit for a while. Since Tag and I made great time we decided to spend some time checking it out. Granada is on the northwest shore of Lake Nicaragua. The lake is enormous. It has a surface area of 3,191 square miles and is the largest lake in Central America. There are over 400 islands in the lake. 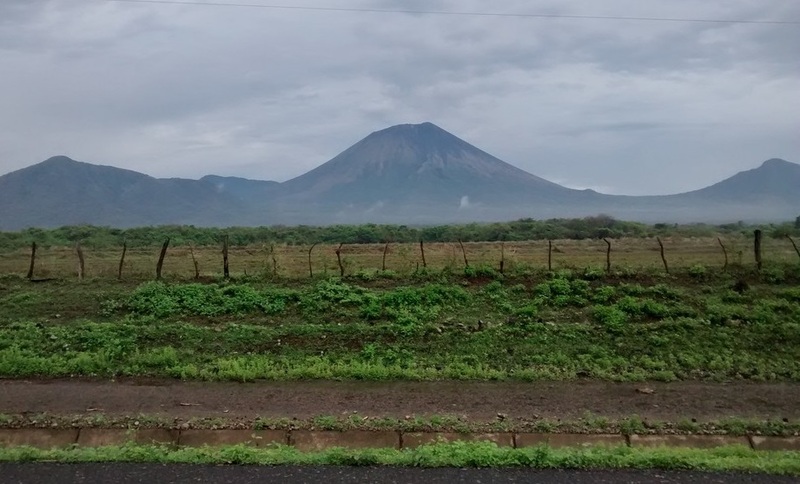 The largest is named Ometepe and has two volcanoes on it. Simply put the geography is epic. It is also an incredibly cheap town. The food, hotels, drinks, etc. are all very reasonable and reminiscent of many of the values found in Guatemala. The town reminded me of Antigua, Guatemala except there are no cobblestone streets. One morning, I chatted with some expats that live in Granada. They told me about Laguna de Apoyo. It is a beautiful, clean, calm lagoon with crystal clear water that is in the crater of a volcano. The water in the lagoon is heated by underground hot springs and is only 20 minutes from Granada. We had to check it out. Laguna de Apoyo from above. You can see the shores of Lake Nicaragua in the background. The lake was the perfect temperature. Not too hot, not too cold, just right! The scenery was mesmerizing. Tag was eager to swim in the lagoon. He said he was going to swim to the floating dock, and did. Recyclced tires made into chairs. They were very comfotable. The lagoon was a big treat. If you are travelling to Granada, it's worth the detour. You'll need a car or you'll have to hire a taxi to take you to and from the lagoon. Excuse me while I rant. This could easily be it's own post. We spent two and a half days exploring Nicaragua. Primarily in and around Granada. During that time I got pulled over three times for doing nothing wrong. I'm no stranger to military and police checkpoints in Central America. I was commonly stopped at them in Guatemala and it was almost always a quick look at my papers followed by a courteous "Gracias, adios" from the cops. They never tried to do anything underhanded. Just to be on the safe side I never gave them our official/authentic paperwork. I'd always give them photocopies to examine. At all three Nicaraguan checkpoints I handed over photocopies of everything the police asked for but the cops always insisted I give them my authentic US driver's license to examine. Each time I finally did. One of the three stops was a legitimate police checkpoint. They were pulling over all cars and were looking for anything suspicious. They looked at my papers and official Washington State license and eventually let me move on. The other two stops were dirty cops! Both times I was driving along with the flow of traffic and was motioned over by police standing on the side of the road. They too required me to hand over my official US drivers license. The difference this time was that they attempted to use it as leverage for a bribe. If I wanted it back (and I would need it to exit the country) then I needed to pay them $40 US right there. If I did not pay it then they would write me a ticket for a trumped up charge (one was for speeding, one was for passing illegally) and mail my licenses to the capital where it would be held for 2 weeks. What a bunch of @#$%! So what could I do? In the event they were telling the truth about sending my license to the capital I would be up a creek. I needed to be in Costa Rica in 1-2 days. I knew it was a shake down. They had seen the US plates on my car and they were looking for easy money. I fought back by playing their game with my rules. The first time I played my cards close. I had not given the cop any indication that I knew Spanish so, I suddenly forget all I know. I just smiled, acted like I did not know what he was saying and kept politely talking back in English. After about 15 minutes of playing "dumb American" he got frustrated and let me go. Thankfully he did not know any English. At one point my cover was almost blown. Tag kept hearing me say "I'm sorry I don't understand" in English. So Tag piped up from the backseat, "Dad, just talk to him in Spanish". Thankfully, his comment went unnoticed by the officer. The second time the officer actually knew some English and I had to change my strategy. My Spanish was better than his English so I argued with him in Spanish. I told him I had done nothing wrong and was not going to pay him. We went back and forth. He kept escalating his threats. I kept my cool and just kept politely telling him that what he was saying was not true and that I was not going to pay. It was a risk as he still had my license. After 10 minutes, he got tired of repeating himself and hearing me say, "no". He sent his female partner over. She gave me the same spiel, and I gave her the same rebuttal. I decided it was time to start wasting their time and told her I needed talk with my son (he was asking tons of questions anyway). I turned my back on them for several minutes and explained to Tag exactly what they were trying to do. They finally got bored with me, gave me back my license and let me go. I found out by talking to locals that this is unfortunately very common because the police are not paid a fair wage. Many just scrape by and turn to this kind of extortion for extra money. Nicaragua, please pay your police more! You have a beautiful country and we'll be back, but come on! The people who are supposed to be upholding the laws are breaking them. Sad. The day had come where we needed to leave Nica and head to our new home in Costa Rica. We left Granada at 6 AM and drove into Costa Rica with no issues. The drive down the Costa Rican coast is a long one. It was a 5 hour drive from the border to the small beach town where we are house sitting. When we arrived into town we were greeted by a biker gang that had jackets that said "Soldier's for Christ". It was a welcome change after dealing with crooked cops in Nicaragua. Langosta Feliz, the Happy Lobster. It's the only restaurant in our beach town. Including our site seeing the total trip was 883 miles. We had no car problems and paid no bribes! I never needed to show the document stating Mick was okay with me travelling solo with Tag. When the trip was complete, I had a good mix of foreign currency in my wallet. Next up...Mick and Ela's trip!